John Glassie, a former contributing editor to The New York Times Magazine, has written for The Believer, The New Republic, The New York Times, The Paris Review Daily, Salon, and Wired. He is the author of the photo book Bicycles Locked to Poles and lives in Brooklyn, New York. "This fascinating biography of the Renaissance polymath Athanasius Kircher explores the birth of modern science through the life of one of the last pre-modern geniuses." “In his quirky biography of Athanasius Kircher … Mr. Glassie uses Kircher as something of a comic foil to show how erroneous ideas about investigating nature helped lead to modern science... [A] spirited telling." "In the course of his life, Kircher opined, almost invariably incorrectly, about the nature of light, magnetism, and the geography of the earth…Glassie has a genuine affection for Kircher despite the latter's laughably bizarre theories and self-aggrandizing egotism. In fact, the author's affection humanizes Kircher, making him oddly credible." "His sharp eye for the absurd helps Glassie make Kircher's story interesting and superbly human.... Glassie tells Kircher's complex story with humor and genuine passion, using fascinating details to bring us into Kircher's world. " 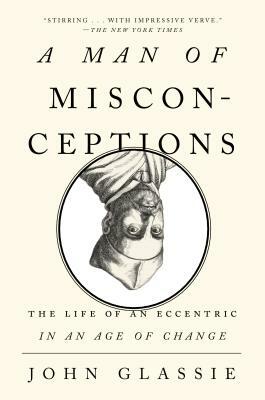 "What makes A Man of Misconceptions fascinating is how it sets the intellectual scene of the 17th century ... and it's that clarity of scene that helps make sense of a contradictory character."